Akron, Ohio’s If These Trees Could Talk have signed with Metal Blade Records! 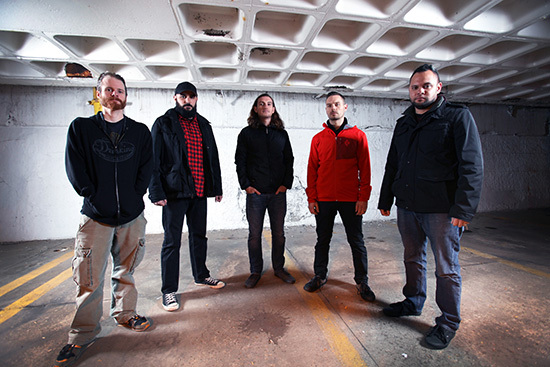 The post-rock outfit was properly formed in 2005 and has grown tremendously since their humble origins in Zack Kelly’s basement as an instrumental project in college. They have since released two full length albums and an EP. Both albums, plus the EP, are available now digitally, but the albums have been out of print on CD. Both “Red Forest” (2012) and “Above the Earth, Below the Sky” (2009) are being repressed on CD by Metal Blade Records and will be available worldwide on January 27th, 2015! Music and cd pre-orders are available now at metalblade.com/ifthesetreescouldtalk. And, of course, the band is fast at work on their third full-length album and Metal Blade debut. Producer/drummer Zack Kelly, along with guitarists Michael Socrates, Cody Kelly, Jeff Kalal, and bassist Tom Fihe will be tracking the record throughout the 2014/15 winter. The instrumental five piece promises to release one of the finest pieces of post-rock/metal of 2015. In the middle of 2014, while the band was already working on their third album, they were approached by Metal Blade Records. Their independent and entirely self-motivated approach to their music and art will not change, however. Recording for the album will take place at their studio in Ohio. Drummer Zack Kelly will produce – he has produced each of the band’s previous albums, with engineering and mixing assistance by Rick Fuller, who also assisted during the recording of “Red Forest“. Music from the band’s catalog has been heard in Sony PS3 titles, and on NBC, MTV, VH1, the NFL, in videos for Vans, and for projects on the Sundance Film Festival. Cumulatively, If These Trees Could Talk albums have sold over 20,000 copies, plus 3,000 more on vinyl.